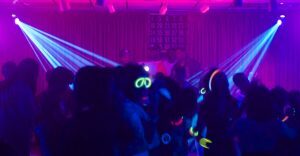 Highlighter or blacklight parties can be a lot of fun! Everyone shows up to the party wearing a plain white t-shirt or long sleeve shirt and jeans or other dark pants they don’t mind getting highlighter on. Everyone is given a highlighter or multiple highlighters that will be theirs to use throughout the night. 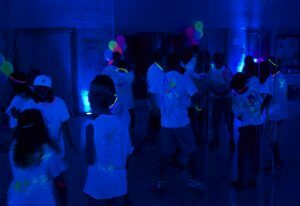 The blacklights around the room make the highlighter glow brightly, hence the highlighter & blacklight party! During the party everyone has the opportunity to write on other peoples shirts. It’s good to have guidelines for guests so you don’t have things that you wouldn’t want to show your parents at the end of the night. Generally people end up drawing on everything so it’s better to do it in a place that can be easily cleaned and the walls wiped down. At the end of the night everyone has their own unique highlighter shirt to take home with their own bit of artwork. 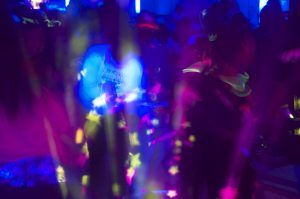 Blacklight parties produce great pictures of everyone glowing at the end of the night and is definitely a lot of fun for a sweet sixteen party! 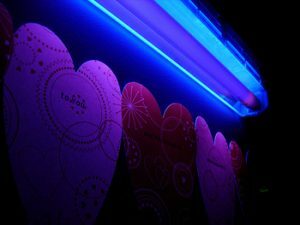 If you are having the party in a living room or small basement 20ftx20ft or smaller it makes sense to buy your blacklights. The best cheap blacklights you can get are the tube fluorescent types. If you have a room that is bigger than 20ftx20ft your best option is to rent blacklights. We like to rent from goboprojectorrental.com because they have the lowest price and offer free shipping nationwide. For rooms greater than 20ft in size you need a medium to long throw blacklight(s). These types of blacklights are a lot more expensive than the short throw fluorescent tubes because they need to “throw” the blacklight over a long distance, or cover a large area and are high powered. If you don’t use one of these lights you won’t be able to make things glow. Examples of glow things are glow sticks, necklaces, neon colored clothes, tide, anything white. These will look awesome throughout the night and will help make your party really stand out. Little known fact that Tide and other laundry detergents actually shine under blacklight. You can draw on walls or garbage bags that you can cut and put on the walls to come up with designs that will show up once the party starts. If you cover a room in trash bags and then put tide on them it makes clean up a snap at the end of the night. If you take plastic 2 liter bottles, clean them out, and use clear ones you can put the inside of a highlighter into the bottle and fill it up with water. Wait a day and shake it and the resulting liquid will glow very very bright under blacklight. These can be very cool centerpieces and it’s a great way to recycle everyone’s old bottles. Make sure you have enough blacklights: (1) 6ft blacklight for every 25ft of wall length in a room, and a dark room to make sure you can keep everything glowing. Check our our Pinterest pages for Cake Ideas and Decoration Ideas! These parties can be a blast! They aren’t too expensive and you and your friends get to express their creativity and individuality! It’s cool to glow at night and if you have the right music it can really be a fun time. The sky is the limit!